Tracking uses a heading that maintains the desired track to or from the station regardless of crosswind conditions. Interpretation of the heading indicator and needle is done to maintain a constant MB to or from the station. To track inbound, turn to the heading that produces a zero RB. Maintain this heading until off-course drift is indicated by displacement of the needle, which occurs if there is a crosswind (needle moving left = wind from the left; needle moving right = wind from the right). 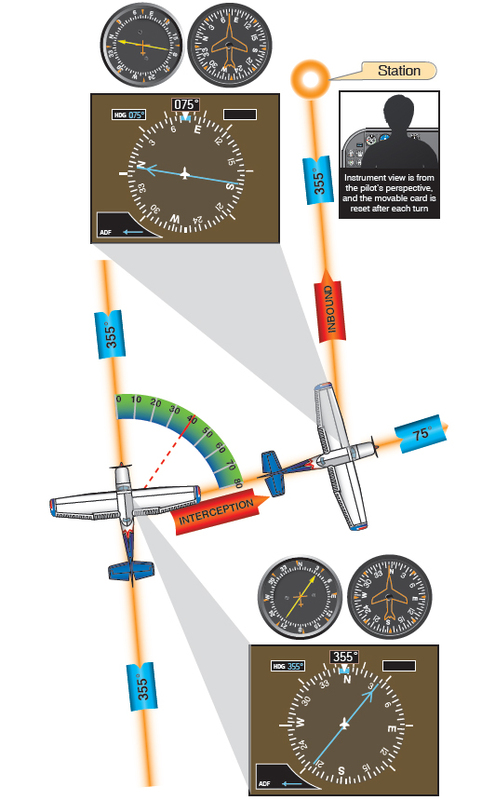 A rapid rate of bearing change with a constant heading indicates either a strong crosswind or close proximity to the station or both. When there is a definite (2° to 5°) change in needle reading, turn in the direction of needle deflection to intercept the initial MB. The angle of interception must be greater than the number of degrees of drift, otherwise the aircraft slowly drifts due to the wind pushing the aircraft. If repeated often enough, the track to the station appears circular and the distance greatly increased as compared to a straight track. The intercept angle depends on the rate of drift, the aircraft speed, and station proximity. Initially, it is standard to double the RB when turning toward your course. For example, if your heading equals your course and the needle points 10° left, turn 20° left, twice the initial RB. [Figure 9-7] This is your intercept angle to capture the RB. Hold this heading until the needle is deflected 20° in the opposite direction. That is, the deflection of the needle equals the interception angle (in this case 20°). The track has been intercepted, and the aircraft remains on track as long as the RB remains the same number of degrees as the wind correction angle (WCA), the angle between the desired track and the heading of the aircraft necessary to keep the aircraft tracking over the desired track. Lead the interception to avoid overshooting the track. Turn 10° toward the inbound course. You are now inbound with a 10° left correction angle. NOTE: In Figure 9-7, for the aircraft closest to the station, the WCA is 10° left and the RB is 10° right. If those values do not change, the aircraft tracks directly to the station. If you observe off-course deflection in the original direction, turn again to the original interception heading. When the desired course has been re-intercepted, turn 5° toward the inbound course, proceeding inbound with a 15° drift correction. If the initial 10° drift correction is excessive, as shown by needle deflection away from the wind, turn to parallel the desired course and let the wind drift you back on course. When the needle is again zeroed, turn into the wind with a reduced drift correction angle. To track outbound, the same principles apply: needle moving left = wind from the left, needle moving right = wind from the right. Wind correction is made toward the needle deflection. The only exception is while the turn to establish the WCA is being made, the direction of the azimuth needle deflections is reversed. When tracking inbound, needle deflection decreases while turning to establish the WCA, and needle deflection increases when tracking outbound. Note the example of course interception and outbound tracking in Figure 9-8. Figure 9-9. Interception of bearing. Determine your position in relation to the station by paralleling the desired inbound bearing. In this case, turn to a heading of 355°. Note that the station is to the right front of the aircraft. Determine the number of degrees of needle deflection from the nose of the aircraft. In this case, the needle’s RB from the aircraft’s nose is 40° to the right. A rule of thumb for interception is to double this RB amount as an interception angle (80°). Turn the aircraft toward the desired MB the number of degrees determined for the interception angle, which as indicated (in two above) is twice the initial RB (40°) or, in this case, 80°. Therefore, the right turn is 80° from the initial MB of 355° or a turn to 075° magnetic (355° + 80° + 075°). Maintain this interception heading of 075° until the needle is deflected the same number of degrees “left” from the zero position as the angle of interception 080° (minus any lead appropriate for the rate at which the bearing is changing). Turn left 80° and the RB (in a no wind condition and with proper compensation for the rate of the ADF needle movement) should be 0° or directly off the nose. Additionally, the MB should be 355° indicating proper interception of the desired course. 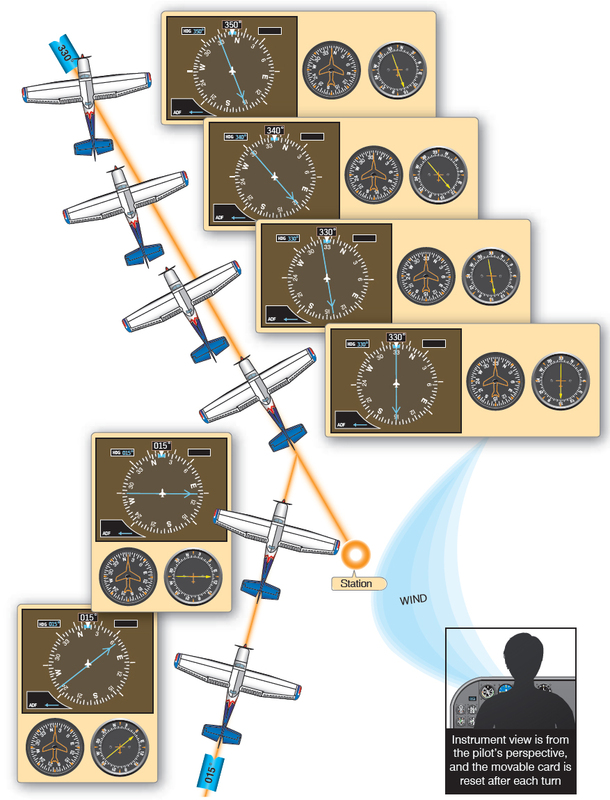 NOTE: The rate of an ADF needle movement, or any bearing pointer for that matter, is faster as aircraft position becomes closer to the station or waypoint (WP). Interception of an outbound MB can be accomplished by the same procedures as for the inbound intercept, except that it is necessary to substitute the 180° position for the zero position on the needle. Failure to keep the heading indicator set so that it agrees with the corrected magnetic compass reading. 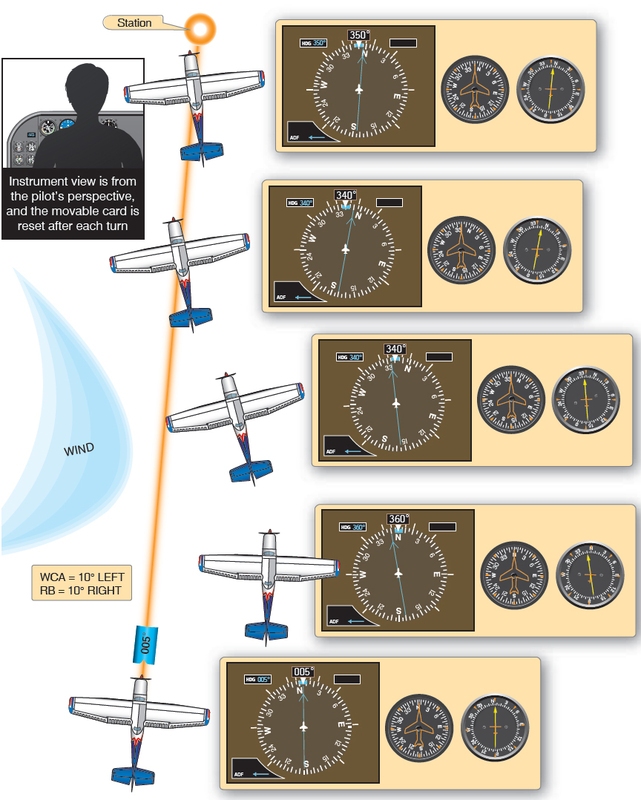 Initiating an ADF approach without verifying that the heading indicator agrees with the corrected compass indicator reading may cause the pilot to believe that he is on course but still impact the terrain (CFIT). Improper tuning and station identification. Many pilots have made the mistake of homing or tracking to the wrong station. Positively identifying any malfunctions of the RMI slaving system or ignoring the warning flag. Dependence on homing rather than proper tracking. This commonly results from sole reliance on the ADF indications rather than correlating them with heading indications. Poor orientation due to failure to follow proper steps in orientation and tracking. Careless interception angles, very likely to happen if you rush the initial orientation procedure. Overshooting and undershooting predetermined MBs, often due to forgetting the course interception angles used. Failure to maintain selected headings. Any heading change is accompanied by an ADF needle change. The instruments must be read in combination before any interpretation is made. Failure to understand the limitations of the ADF and the factors that affect its use. Overcontrolling track corrections close to the station (chasing the ADF needle) due to failure to understand or recognize station approach.